Cooling seasonal temps have long denied man his most primordial need: playing golf while enjoying beers and stacks of onion rings. Thankfully, TopGolf has your frosty back with year-round golf bays that are heated, wind-protected, and very onion-ring friendly. If you live by the motto, “What’s good for the grizzly is good for the gander,” then gander at the video above and start wrangling your friends who enjoy climate-controlled golfing and pro football game-day drink-and-grub specials like $12 domestic buckets and half-priced apps and 50-cent wings -- which you can score without answering 21 questions. Then there are everyday bites like wings, those onion rings, and specials that can only be unlocked via FourSquare. 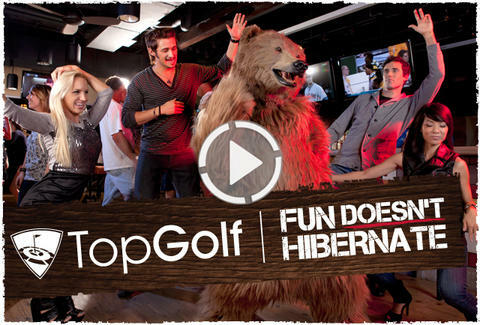 Get back to man's other primeval custom (procrastinating during work) by taking a virtual tour at TopGolf.com, then start planning your next bachelor party, holiday bash, or it’s-Tuesday-why-not party.